What we’ve also learned is that alliance management teams are dealing with growing portfolios of alliances to manage along with greater technical components to their alliances. Some 86 percent of interviewees report growing portfolios. Growth has come through many avenues, bringing greater complexity and a more dynamic environment. Alliance portfolios have grown as companies externalized their research functions and looked to access new technologies and mechanisms of action developed by specialized biotechs. Platform technologies spin off compounds applicable across multiple targets. Immunotherapy has yielded promising results for patients and a plethora of clinical trials of combination therapies. A single alliance agreement is now yielding multiple research and/or development programs, some of which must be segregated, or “firewalled,” to protect intellectual property. Alliance leaders now face the challenge of allocating resources to manage the sheer volume of work coming from burgeoning portfolios, coupled with the acknowledgement that for alliance managers to truly add value, they need to be engaged with and immersed in the teams executing the work of the alliance. When we presented our initial findings in a March 2018 ASAP Netcast webinar, we polled participants; 38 percent reported managing the amount of work as their greatest challenge. There are a few key strategies being employed: scoping, tiering, and leveraging other functions. These are often combined. Most large pharma companies have multiple alliance management teams, specialized for specific types of alliances. They may divide responsibility by life cycle stage (e.g., pre- and post-proof of concept). A few companies divide responsibility by therapeutic area, especially if the company itself is organized that way. It helps develop the technical understanding increasingly required of alliance managers. There are specialty teams, too. These groups manage local licensees for commercial-stage products, mainly in developing markets such as Latin America or Asia. Japan-based alliances typically get their own team, located in Japan. 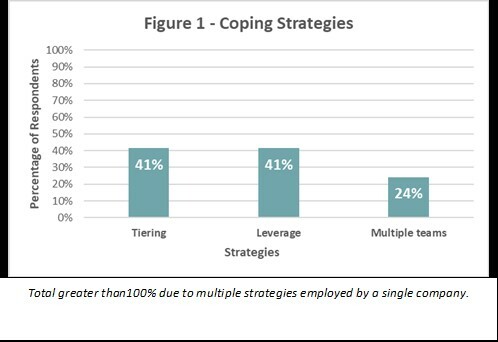 Leveraging other functions is a strategy also employed by 41 percent of interviewees, irrespective of the size of the alliance management team(s) or company. Other functions—primarily product and program or project managers—are leveraged in two ways. They often assume primary management responsibility for lower-tier alliances. Sometimes this is an acknowledged responsibility; often it is just part of the job, and thus the alliance really isn’t managed. “My team and I manage six or seven alliances each. There are at least ten more that could be better managed,” an interviewee busy building capability in a mature company with many alliances, but new to alliance management, told us. In an emerging practice, primarily among smaller companies introducing alliance management for the first time, alliance management responsibilities are being scoped such that routine functions, including lower-level governance meetings and reporting, are largely handled by program or project management. This leaves the alliance manager to handle higher value-add responsibilities, such as contractual oversight, problem resolution, launches, evaluation, and new opportunities, to name a few. Chances are, your portfolio will keep growing. Create a proactive approach for how you will staff new alliances, divestitures and winddowns, and alliances assumed through acquisitions. Some alliance management teams are leading and coordinating the integration of acquisitions in their entirety. In what combination will you tier or segment alliances and leverage other functions, in addition to carefully scoping the alliances your team will handle? Build your argument for additional headcount now and determine the triggers that require the next person as the portfolio grows. Help executives understand how much of revenue and the percentage of your pipeline—the future revenues—depend on alliances—and what lean yet properly staffed alliance management costs. Identify and qualify internal and external candidates before you need them. Think about how you can use additional personnel who have specialized functions, such as operations and communications. This lets your alliance professionals focus on what they do best while creating a career development path for future alliance managers. It maybe a high-class problem to solve, but with a little creativity can strengthen your team and position it to take on more responsibility as the need for alliance management in biopharma only intensifies. See Part Three of ASAP’s Handbook of Alliance Management: A Practitioner’s Guide or download “The Partner Portfolio Manager: Shining the Spotlight on Performance and Value” https://rhythmofbusiness.com/insights.php?pid=40 and “Measuring and Managing the Alliance Portfolio” https://rhythmofbusiness.com/insights.php?pid=36 to learn a simple methodology for evaluating your portfolio and developing specific staffing and management strategies for each tier or segment.